As one of the premier Serbian ammunition manufacturers in the world, Prvi Partizan continues to produce high quality, high powered rifle ammunition at extremely competitive prices. 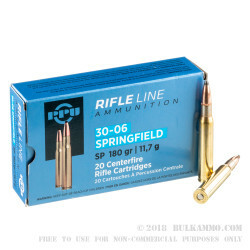 With the introduction of the 180gr 30-06 Springfield Soft Point, shooters can now afford to hunt as often as they train, and take their level of lethality and preparedness to the next level. The Prvi partizan 180 grain 30-06 Springfield Soft Point is well suited for hunting any large game within the continental United States. 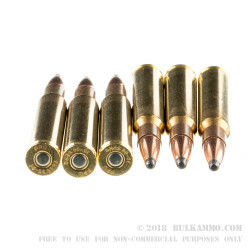 Black bear, mountain lion, and bighorn sheep will be well within your reach, and are quickly, and humanely brought down with the power of the 30-06 cartridge. At a max effective range out to 500 yards and beyond, few targets are outside your grasp. Average muzzles velocities north of 2,690 feet per second max for a truly devastating temporal cavity, and take full advantage of the Prvi Partizan’s soft point bullet technology to maximize expansion upon impact. 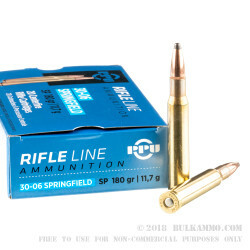 Hunters in search a serious hunting round at a rock bottom price will find one of the most resilient and lethal rounds on the market to date in the Prvi Partisan 180gr 30-06 Springfield Soft point. 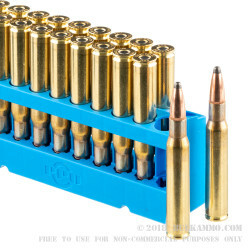 A: These are reloadable. Prvi Partizan (PPU) loads their brass line of ammo with boxer primers. Their brass is of high quality which will serve well for multiple loadings if needed.